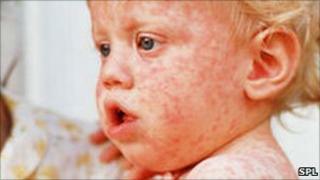 Image caption Measles can be highly dangerous and in some cases fatal. Ninety per cent of two-year-old children in the UK have received their first dose of the MMR vaccine - the highest level for 13 years, says the Health Protection Agency. But this is still short of the 95% uptake rate which would stop the spread of the disease in the community. A measles epidemic spreading across Europe in recent months is thought to be behind the rise in immunisations. The HPA is urging parents to vaccinate their children before they travel. In the UK, two doses of the MMR vaccine are usually given, the first at around 12 months and the second around the time of starting school. The increase in the number of children aged two receiving their first dose is a 0.6% rise on the previous quarter. The uptake rate for two doses in children aged five increased by 0.3% from the previous quarter to 85.1%, show the HPA's figures. How safe is it to take children to mainland Europe who have had two doses of the MMR vaccine? It gives 99% protection against the measles virus. What if they have had only one dose of MMR? One dose is better than none, but two doses is better than one. If you are concerned about travelling to an outbreak area you can bring forward the second MMR dose. Speak to your GP about it. What if my children are not vaccinated at all? The advice is to go to your GP and arrange for them to be immunised as soon as possible before you travel. Measles is a dangerous viral illness which can be fatal. Children who received their first dose of the MMR vaccine by the age of 5 in the UK remains at 92.8%. Dr Mary Ramsay, head of the immunisation department at the HPA, said she was pleased by the figures. "We're very encouraged to see that UK MMR uptake has reached 90 per cent in children aged two, indicating increasing levels of trust by parents in the immunisation programme." The Health Protection Agency says that in England and Wales there has been a total of 496 confirmed measles cases between January and May 2011. This is more than the 374 total for the whole of last year. It says the new cases of measles in England and Wales are predominately in children and adults under 19 years old, the vast majority of whom are unvaccinated. Mary Ramsay said: "Anyone who missed out on MMR as a child will continue to be at risk of measles, which explains why we are seeing these new cases in a broad age range." The outbreak is thought to be linked to an epidemic in Europe where more than 11,000 cases have been reported across 35 European countries in the first four months of this year. In France, where the outbreak appears to have started, more than 7,000 cases were reported between January and April this year. Dr Ramsay said families should plan to vaccinate their children before the summer. "It's that time of year when children are travelling on school trips and family holidays and we are reminding parents and young adults of the importance of immunisation before they travel. "We cannot stress enough that measles is serious and in some cases it can be fatal."